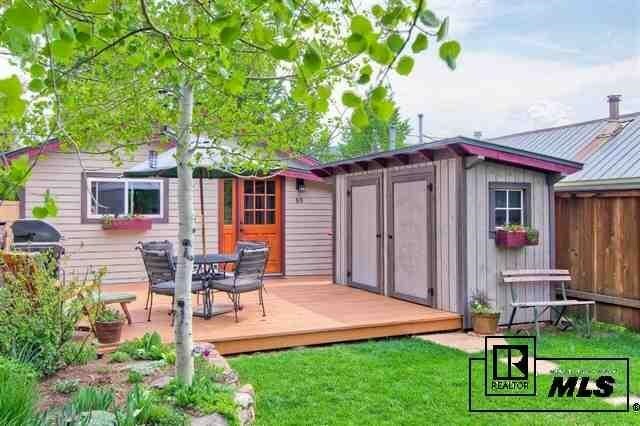 Adorable home in a sought after Old Town Steamboat Springs location. This 2 plus bedroom, 1 bath home sits on a quiet, family street steps from Stehley Park and the Butcher Knife Canyon trail as well as Soda Creek School. Sit on your deck and enjoy the expansive, fenced lawn and irrigated flower gardens which have been meticulously cared for by the landscape architect owner. The home has been completely remodeled by the owner/builder with granite tile and butcher block counters, tiled backsplash, hardwood floors, new siding, new roof and new shed. The home is small, yet efficient with everything you need to enjoy life in downtown Steamboat Springs with little maintenance! Perfect for a young couple, small family or empty nester. This won't last long.